A recent paper by P. Adler et al., “Productivity Is a Poor Predictor of Plant Species Richness” deals with the relationship between productivity and diversity. 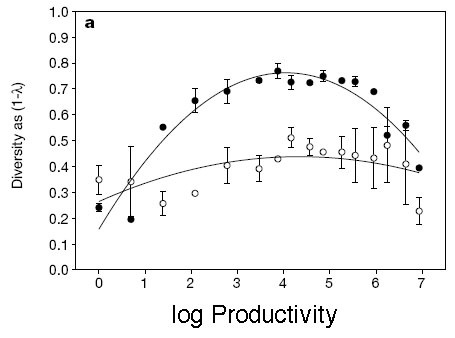 The authors examine an old and, not surprisingly, debated doctrine of ecology, which is that there is generally a hump-shaped relationship between productivity and diversity (as an example of such a relationship, see the figure from a paper by Kassen et al. below). The results of the study by P. Adler et al. are basically that there is very little support for any systematic dependence of diversity on productivity at local and regional scales, and if at all a positive, but not quadratic dependence at global scales. A "classical" hump-shaped productivity diversity relationship from a microcosm experiment by Kassen et al., Nature, 406, 508-512. What I thought was remarkable about the article is that the authors approached their question by means of collaborative network of people collecting data (NutNet) with standardized sampling methods, which enabled them get very good coverage and avoid some of the pitfalls of previous studies and meta-analyses. Of course, this is not the first example of a large collaboration in ecology, but I think the paper still highlights a trend to share data (e.g. databases such as TRY) and collaboratively try to put ecological knowledge on a more solid base by means of assembling larger and more representative datasets (see also Joslin Moore’s post on the “Power of Cooperation”). When there’s light, there is shade, too – one might fear that this development could lead, as in other research fields, to ever longer author’s lists, and difficulties to make the contributions of individual scientists seen and their ideas known. There was a quite interesting news article in Science about the problems that arise within very large cooperations in particle physics. However, I think that we’re not really at the point in Ecology that we have to worry too much about these things, yet. ADDITION 23.3.12: Two technical comments to the paper by Xubin Pan et al. and J. D. Fridley et al., and the corresponding response that were published today may also be of interest. Adler, P. B. et al. (2011) Productivity Is a Poor Predictor of Plant Species Richness Science, 333, 1750-1753. Kassen, R.; Buckling, A.; Bell, G. & Rainey, P. B. (2000) Diversity peaks at intermediate productivity in a laboratory microcosm. Nature, 406, 508-512.